IMIA…connecting the Business of Maps Worldwide! 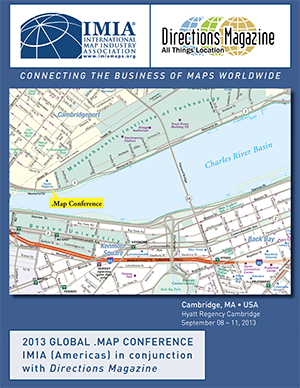 IMIA organizes its own conference and trade show in each region, each year. These events provide members with an opportunity to network with partners, suppliers, and customers – informally and productively. Step into sophisticated luxury at the Hyatt Regency Cambridge hotel, overlooking the Boston skyline. The proud recipient of a AAA Four Diamond Award, Hyatt Regency Cambridge is conveniently situated along the scenic Charles River, where the energy of Boston blends with the intellectual vitality and charm of Cambridge, MA, known for its eclectic cuisine, and cool boutiques. Nestled between Harvard, MIT, Boston University and minutes to Kendall Square business district, Hyatt Regency Cambridge is your ideal oasis when on the go for business. Personalized VIP services, complimentary shuttle service, and our rewarding Hyatt Gold Passport program are a few of the many benefits that await you. Enjoy seasonal New England cuisine at Zephyr on the Charles, offering sweeping river and Boston views. Kick back and unwind while sipping cocktails at the Zephyr Lounge or on our outdoor seasonal patio. Home to philosophers, poets, intellectuals and revolutionaries, Boston is anything but a boring city. It is a town with a concrete identity and plenty of things to do, from Cambridge to Beacon Hill. The city is making an effort to display its charisma to those who are interested. Through innovative architecture, urban projects and a burgeoning art and film scene, Boston has come alive.